The War of 1812 began when the United States declared war on Great Britain. At the time, Britain was already battling France as part of the ongoing Napoleonic Wars. To support the war against the French Empire, Britain had imposed trade restrictions on the U.S. and forced thousands of American seamen to serve the British Royal Navy. For these and other reasons, the U.S. went to war with Britain. When France's Napoleon Bonaparte was deposed in early 1814, the British were able to focus more of their resources and soldiers toward the War of 1812. The British became much more aggressive and launched invasions of the U.S. However, in early September 1814, the U.S. defeated an invading British force at the Battle of Plattsburgh, which is considered a major victory in the War of 1812. The Battle of Plattsburgh was not a random skirmish or surprise attack. Rather, it was both planned and expected ahead of time by both the U.S. and Great Britain. Britain controlled Upper Canada and Lower Canada (the Canadas), so the Canadian-American border was the main front of the War of 1812. The conquest of Canada was the central goal of the U.S. during the war; however, the U.S. failed to make any significant advances by the time the Napoleonic Wars ended. When Britain moved more of its forces to the Canadas, suddenly, the British army had become a much greater threat to the U.S. In particular, the U.S. was in danger of losing Plattsburgh, an essential strategic position for the American army. If lost, then from the Richelieu River in Canada, the British could travel down along Lake Champlain, Lake George, and the Hudson River, effectively covering the length of New York State. Both sides recognized the importance of Plattsburgh as the gateway to New York's main waterways, so in the months leading up to the battle, a shipbuilding race began. On the U.S. side, Master Commandant Thomas Macdonough was in charge of the defense of Lake Champlain. He commissioned shipbuilders Adam and Noah Brown to help the U.S. even the odds against the large British force stationed near Montreal, Canada. The two brothers completed Saratoga (a schooner) in early 1814 and built Eagle (a brig) later that August. Battle of Plattsburgh Forces: Saratoga, Eagle, Ticonderoga, Preble, smaller gunboats, and about 3,400 men. At the British military base along the Richelieu River, shipbuilders were busy completing Confiance (a frigate), larger than any of the American boats. Britain's three other largest ships, Linnet (a brig), Chubb (a sloop), and Finch (a sloop), were all lightly armed. Confiance was their best chance at victory. Battle of Plattsburgh Forces: Confiance, Linnet, Chubb, Finch, smaller gunboats, and about 10,000 men. On August 24, 1814, Macdonough sailed with his ships to Plattsburgh Bay and prepared for the upcoming battle. The four large U.S. ships were anchored in specific positions, and the smaller gunboats were situated between them. This positioning far up inside the bay would force the British ships to have to sail from the Richelieu River down and around the Cumberland Head peninsula, allowing the U.S. to strike first. The British army, led by General George Prevost, and the fleet, led by Captain George Downie, left Montreal on August 31. The British forces arrived near Plattsburgh on September 6 and camped out until September 11. On the morning of September 11, the Battle of Plattsburgh began. 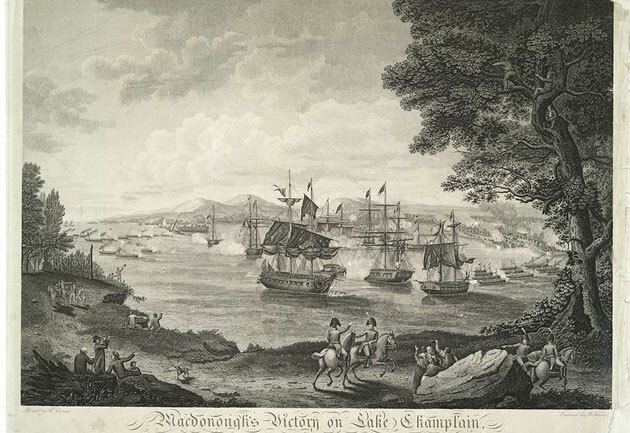 While an outnumbered American force fought the British army along the western side of Lake Champlain, the two naval squadrons engaged in Plattsburgh Bay. Captain Downie brought the British ships close enough to engage, but Macdonough struck first with a shot from Saratoga against Confiance. Soon after, Confiance returned fire with a broadside attack that killed 1/5 of Saratoga's crew. Nevertheless, Saratoga recovered and the battle between the two ships continued. Just 15 minutes into the battle, a cannonball from Saratoga struck Confiance and killed Captain Downie. This was a huge loss for the British because Confiance's crew had inexperienced gunners. Many of the shots fired from Confiance missed their mark, and the ship didn't have a leader to take charge of the situation. The battle continued for over two hours. Both Chubb and Finch were heavily damaged by the American ships, and late in the battle, only Confiance and Linnet were left fighting for the British. Saratoga had sustained heavy damage on the side facing the British ships and was weakening. In a brilliant strategic move, Macdonough maneuvered cables and anchors on board Saratoga to "wind ship," in other words, cause it to pivot. The maneuver was a success, and now Saratoga had a fresh side facing Confiance. Confiance attempted the same maneuver but stalled halfway through, so Saratoga attacked and severely damaged the British ship. With Confiance down and Linnet also in danger, both British ships were forced to surrender. The Battle of Plattsburgh was over. Once news reached General Prevost on land about the defeat of the British naval force, he ordered the immediate retreat of his army. Although his commanders protested this move (the British army still outnumbered the American force), Prevost knew that Lake Champlain was necessary to control the area and resupply his forces. Without a naval force, it would be an empty victory. Confiance, Linnet, Chubb, and Finch were all captured by the U.S., and Prevost was recalled back to Britain. The victory boosted American morale, and coupled with the U.S. victory at Fort McHenry in Maryland, the end of the war was in sight. The decisive victory at the Battle of Plattsburgh helped encourage peace negotiations between the U.S. and Britain, and on December 24, 1814, the Treaty of Ghent was signed, officially ending the War of 1812.